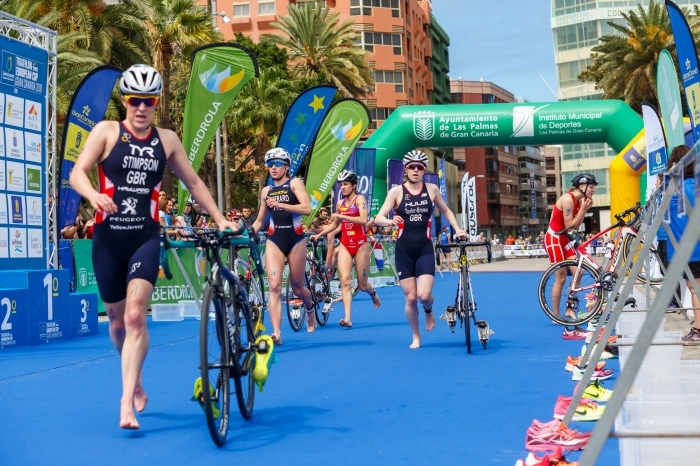 With the snow falling in many parts of northern Europe, it is indeed a pleasure to be able to watch the Elite athletes begin their ETU European Cup journey in the warm sunshine of Gran Canaria. Last year’s debut race was a great success. 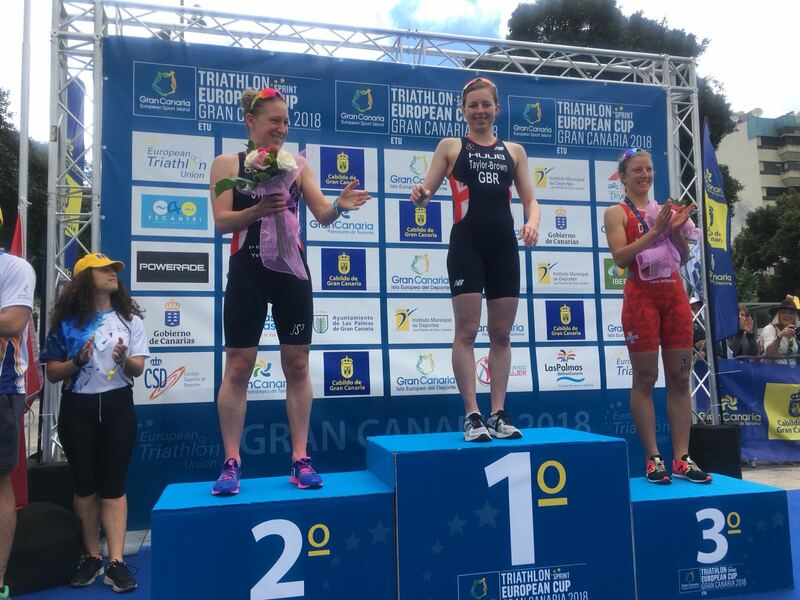 For the women, the 2017 winner, who went on to win the European title in Kitzbühel, Jess Learmonth, is sadly absent as she makes her final preparations for the Commonwealth Games down under in Australia. This leaves the door open for a potential victory for Jodie Stimpson who, due to injury, was unable to make the team. 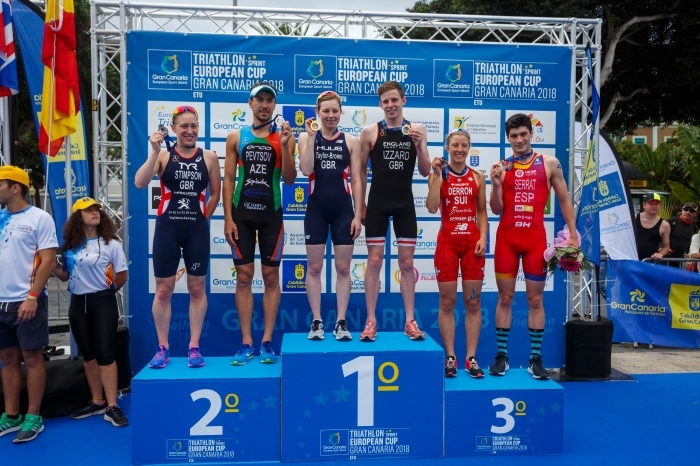 Georgia Taylor-Brown, as 2017 ETU U23 champion, is a strong contender too. 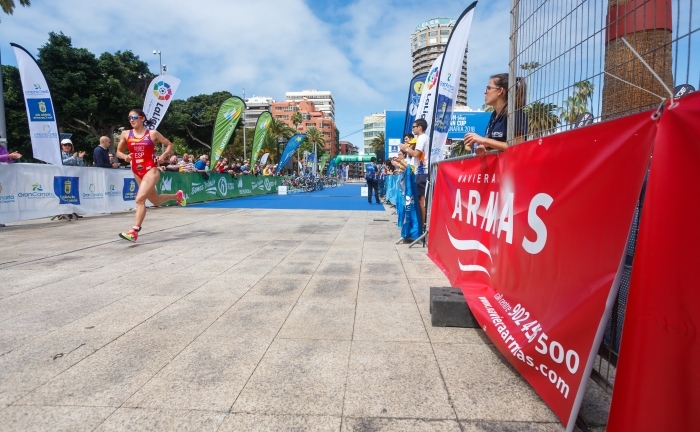 Italy’s Giorgia Priarone and Annamaria Mazzetti would be working hard with Spain’s Anna Godoy Contreras to push the pace. 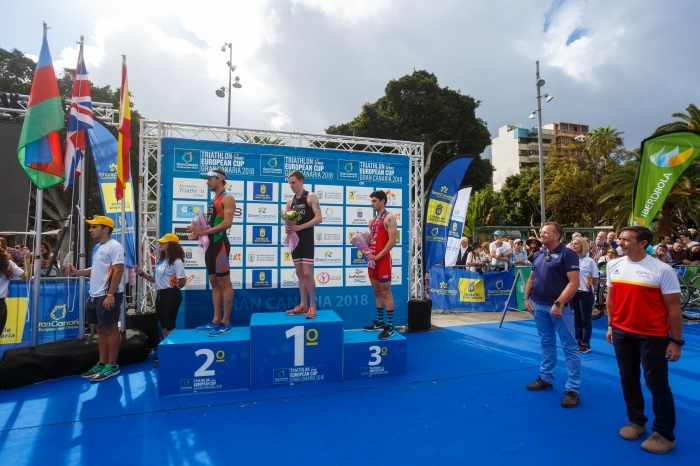 As the spectators and fans greeted the athletes onto the sandy beach, with a revised swim course for 2018, the level of envy around Europe rose – the spectators were all in shorts, enjoying the Canarian sunshine. 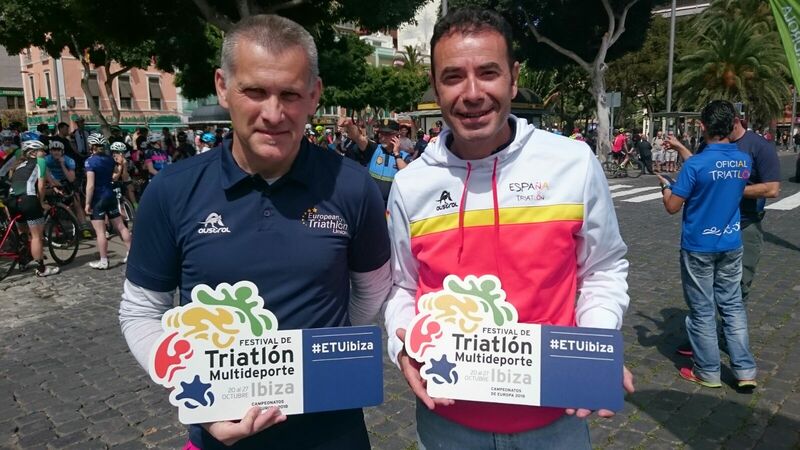 The 53 female athletes looked relaxed and full of smiles on the start as they selected their start positions under the watchful eyes of the technical officials led this year by Peter Klosz ROU, who took the opportunity to promote, with the hosts, the ETU Multisports Festival in Ibiza - if you have not yet booked your place, hurry ! 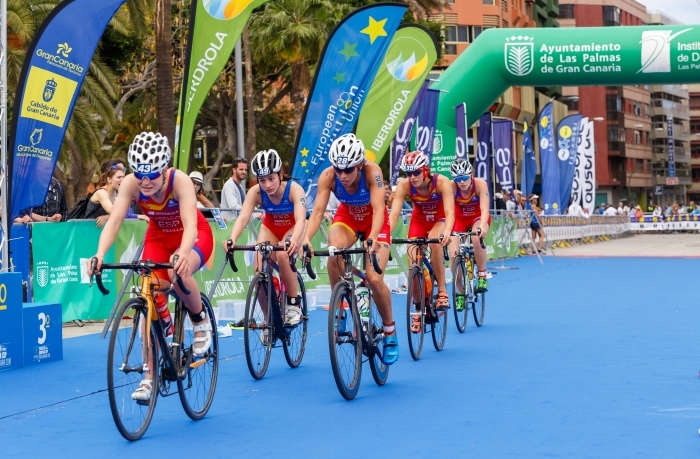 With six Spanish athletes on the start line, there would be plenty of opportunities for the local crowds to cheer on their athletes. 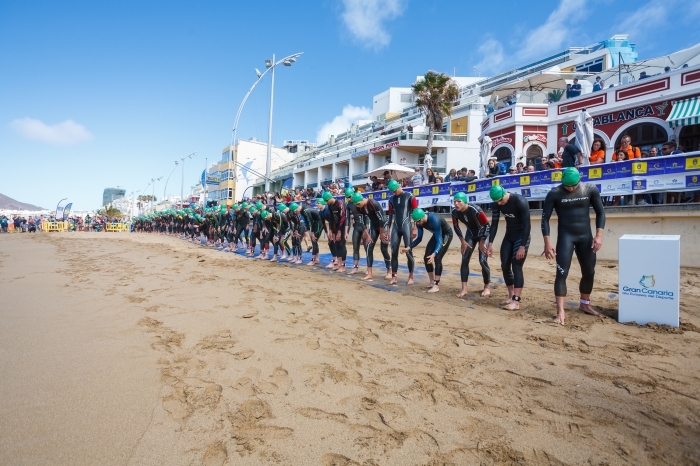 The sea conditions were not easy, with powerful waves disrupting the strokes as the athletes set off on their 750m swim. It really would be a day for those with confidence and experience in the open water. 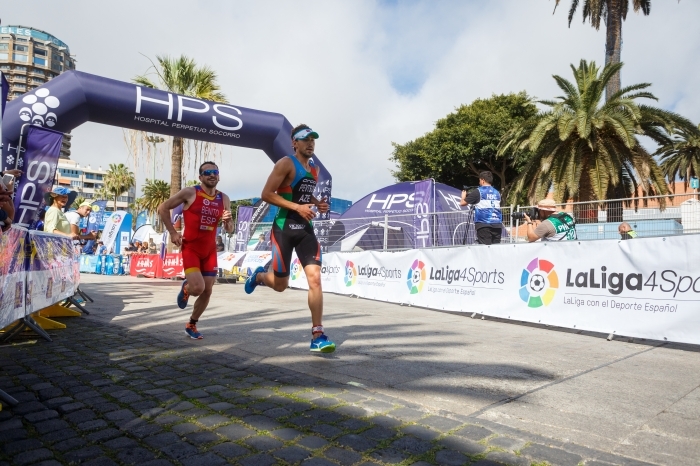 A clear lead was established early on by two athletes who were able to establish a leading advantage over the chasing pack. 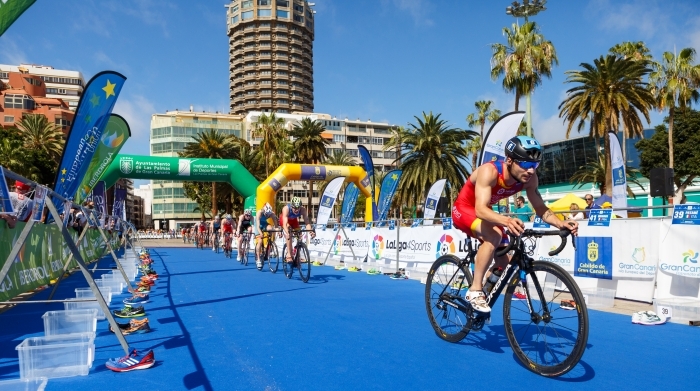 As the athletes turned, that lead faded away as the athletes were tossed around in the sea. 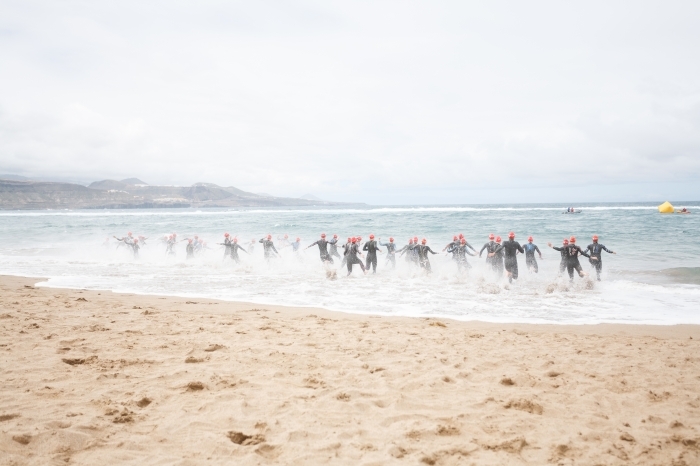 The wetsuits might give additional warmth to them but also, by sitting them higher in the water, this swim must have left some of them feeling quite sea-sick. 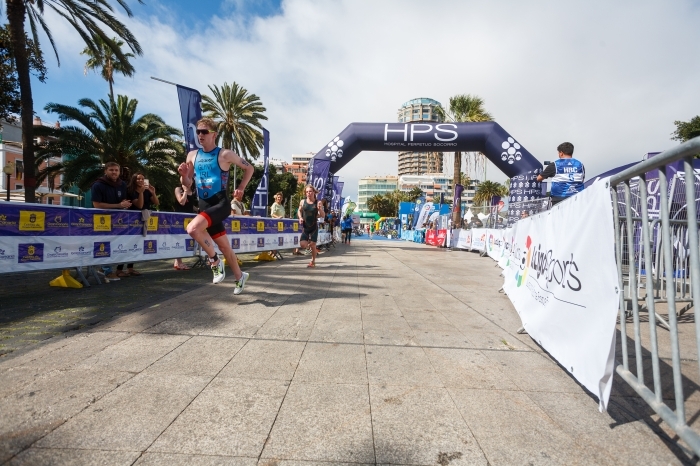 First out of the water and on the run to T1 was Sarah Perez Sala ESP followed immediately by Stimpson and then a huge crowd of athletes. 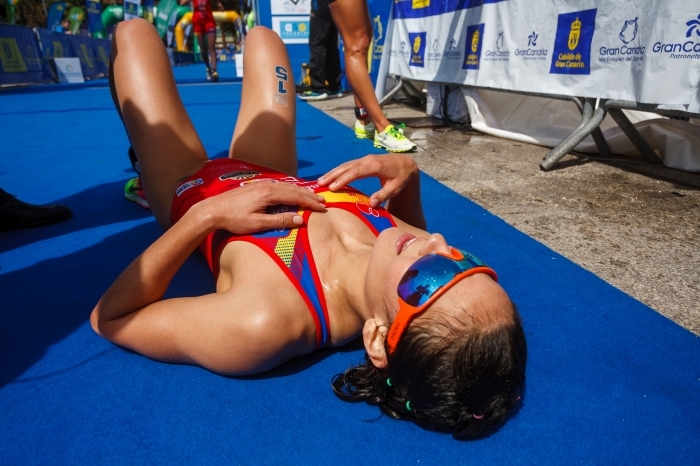 Perez had a great swim compared to her 2017 race. Onto the beach, up some steps and then running to transition. It was essential that no mistakes were made in T1. A time penalty of ten seconds for failing to put used equipment into the box, or a mount-line error would ruin any advantage. It was Perez who had a clear run through T1 and who stormed out on to the road. Low over the bars, she pushed hard, with the crowds cheering her along the roads. Behind her, the peloton worked together to try and bridge the gap. Road conditions looked good for the athletes but there were sections where the winds swept onto the course to make it tough for the athletes. Rain started to fall, making the athletes take extra caution on the multiple turns. Just a shower but enough to make the athletes hold back on the pace. Perez continued to lead through the downtown, technical course. Behind her the chasing athletes appeared to be struggling to keep her in their sights. As the first lap was completed, Perez was cheered along the blue carpet but the peloton, now only 15 seconds down, made up of 8 athletes had some powerful cyclists tucked in. Not only did the chase group have powerful cyclists but also fast runners. The second chase group was 32 seconds down on the 8 and it pretty much looked like the podium would come from the top 9. Should Perez sit up and give her legs a rest? 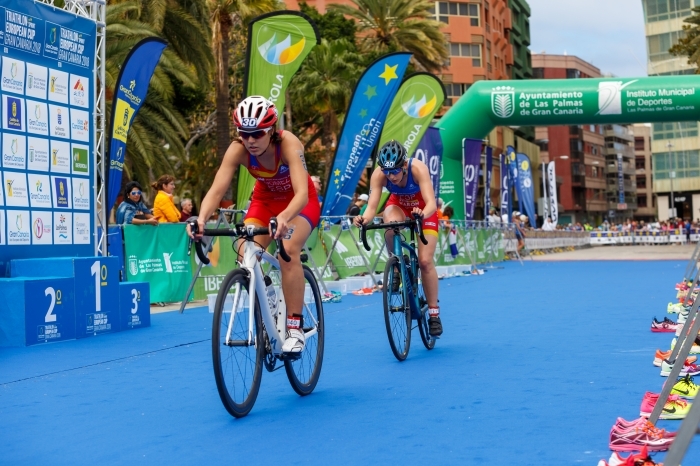 She appeared to be confident in her riding and dug deep to keep her lead, looking relaxed, easy and aero against the wind. Pushing on the hilly sections, she did her best to keep ahead of the chasing 8 but they gradually ate into her lead, benefitting from the pack riding. The wind and the course did its work and Perez was caught. Could she now stay with them and, resting her legs, save something for the run. 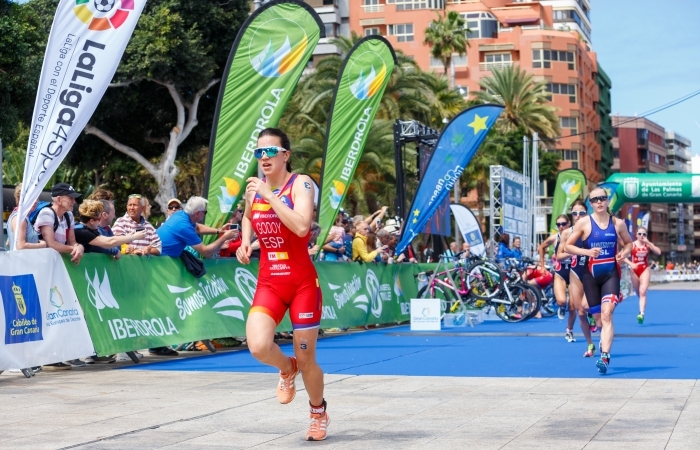 Cecilia Santamaria Surroca ESP, Taylor-Brown, Stimpson, Justine Guerard FRA, Julie Derron SUI, Anne Holm and Alberte Kjaer Pedersen DEN, in that group were now pulling away from the second group and had taken control of the race. Another breakaway on the hill saw a brief advantage come to Derron but with the peloton keeping her in their sights it was not going to last. The gusting winds drew her back into the pack. As they started the final lap, they were down to 8 as Perez lost out big time with a mechanical failure on the bike. 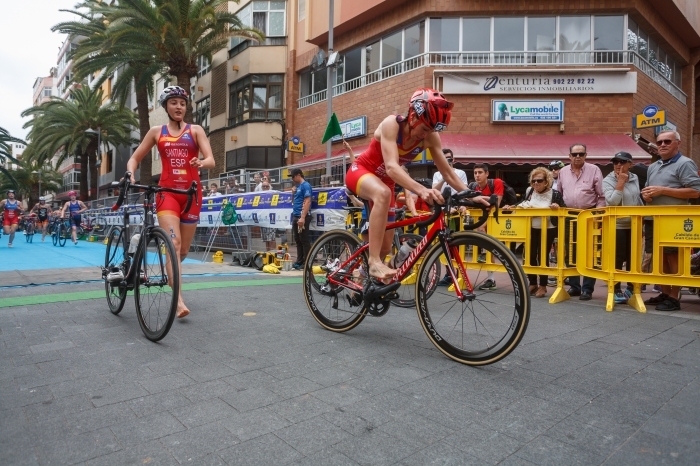 She hastily tried to repair the damage but had lost contact with the leaders.Stimpson soon took control of the pack, urging each athlete to work their share at the front. 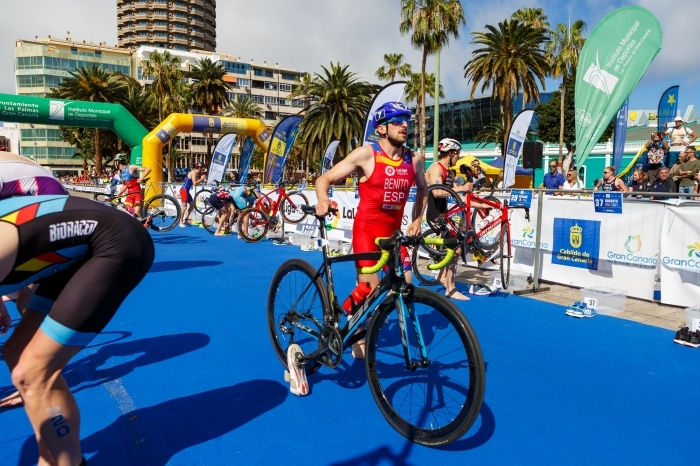 With T2 coming up, the athletes moved strategically to get the best place and to try and avoid any errors that might drop them into the ten second penalty box. 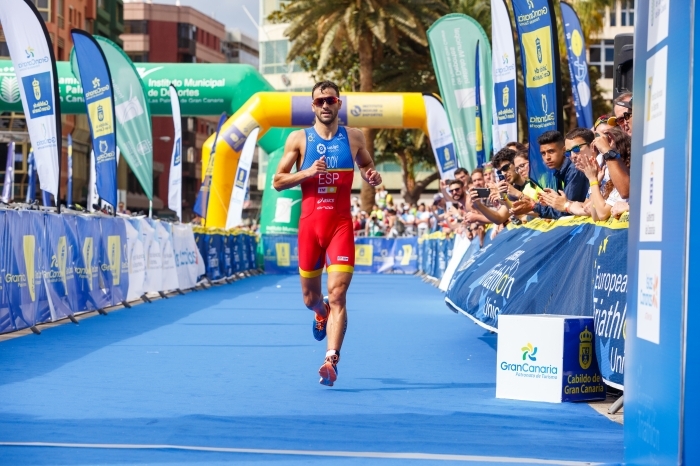 The crowds around T2 were cheering frantically as the athletes arrived on the blue carpet – once again the Spanish Federation working its magic with the music and the live commentary. Holm led them in, with Derron just behind her. 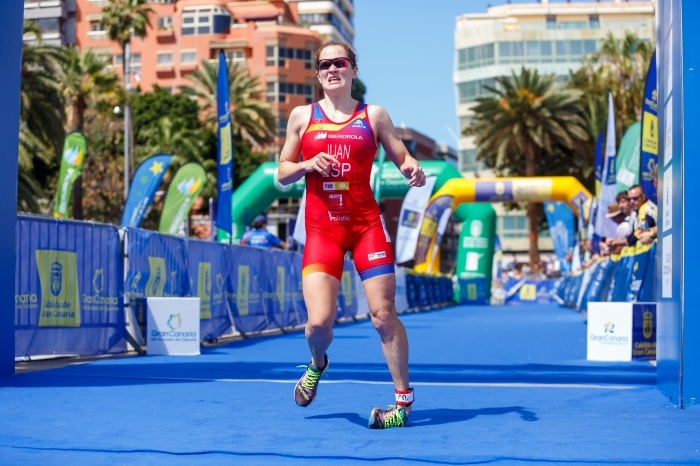 A swift T2 saw Holm lead them out onto the run first as Santamaria struggled with her shoes. Derron immediately went to the front, pulling along the others and Holm began to drift off the back. The chasing pack was now going to have to pull something immense out of the bag to collect any points and prize-money. The leaders were upping the pace. 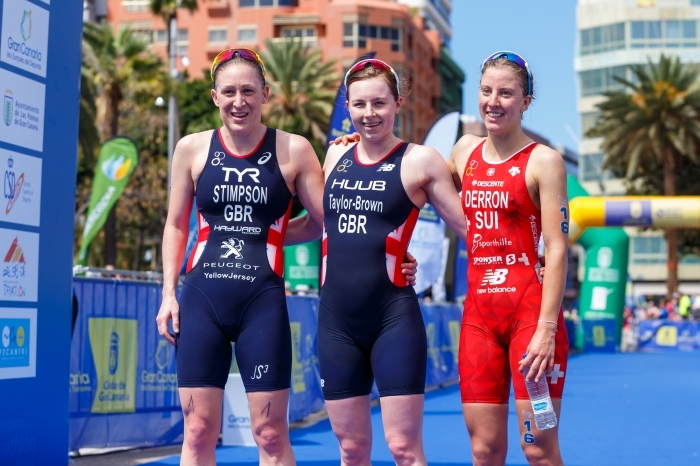 Stimpson, Taylor-Brown, Kjaer, Guerard and Derron were chasing just three medals. Stimpson looked relaxed and showed no signs of her injury being a problem. Derron looked good at the front and as the pace continued to be forced, the first to drop off the back was the French athlete. 5 down to 4. Three medals only. The rains had gone and now the sun was out. Kjaer stayed at the back of the group; waiting and watching. 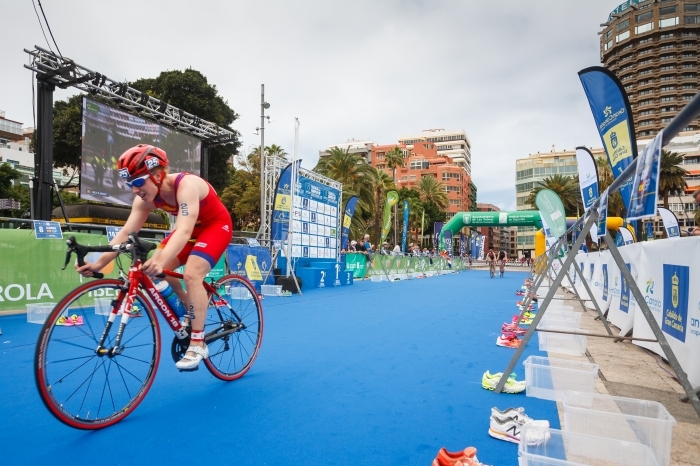 The two Brits alternated turns at the front, with the U23 Champion looking the stronger of the two and striding well. Kjaer’s position at the back suddenly became a position off the back and she watched the 4 pull away. Stimpson kicked and Taylor-Brown replied. Shoulder to shoulder, with Derron a couple of metres adrift the crowds were enjoying the race and the sunshine. Derron did well to keep the two Brits in sight and edged forwards again to keep in contention but Taylor-Brown looked so easy. 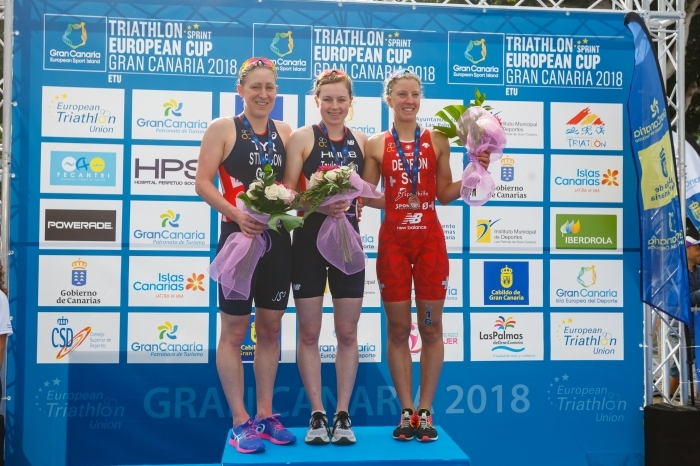 The medals were clearly going to be shared between these three leading women but with a couple of kilometres to go, it was impossible to say who would win. Derron tested the trio but surging again to the front and Stimpson matched her pace for pace. Taylor-Brown was happy to watch them from the back but never once did she let them get anything more than a pace ahead. Taylor-Brown kicked off one of the many turns and created space between her and Stimpson. Derron was back and Taylor-Brown was now leading the race. 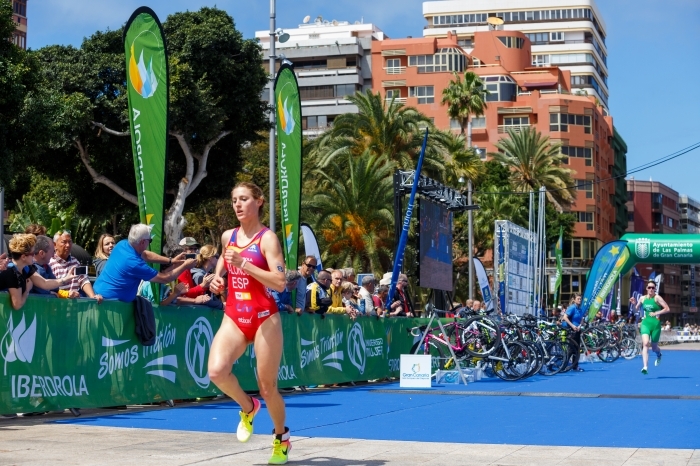 She could hear the commentary from the finish line and effortlessly increased the pace. 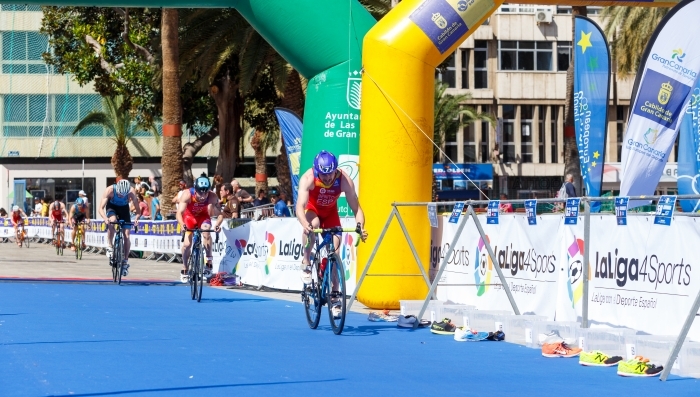 Stimpson dug deep to hold onto silver as Taylor-Brown claimed victory with Derron coming home for bronze. The three athletes had a good lead over those chasing them and it was Kjaer who came in ahead of Guerard. 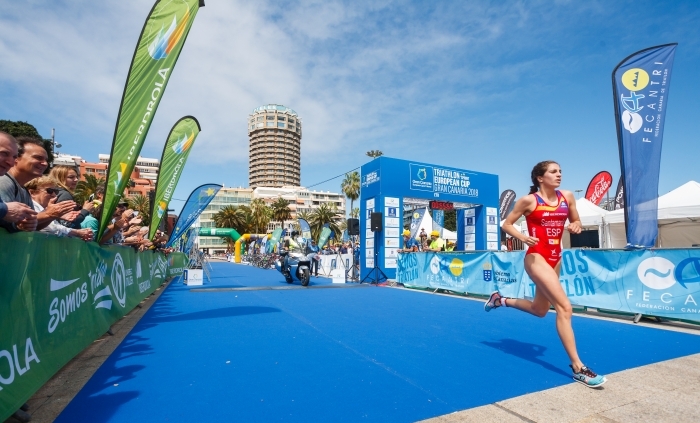 Spain’s first athlete home in the top ten was Santamaria in a sprint finish that gave her 8th place, a guaranteed entry to the Mediterranean Games and to the World Cup squad for the Spanish. The men’s race was bathed in sunshine as the athletes lined up. 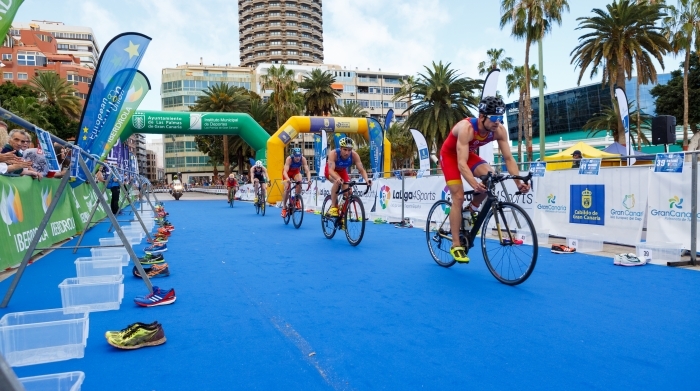 A massive field of 75 men were chasing the medals, points and prize-money and at the front end, with defending title holder, Rostislav Pevtsov AZE being pushed by Spain’s ETU Rankings Winner, Uxío Abuín Ares and Adrien Briffod, we would be guaranteed an exciting race. Wearing #1 Pevtsov selected his position on the start, followed by Abuín and Briffod. The other athletes were then faced with a challenge; where should they stand to get that early advantage? Was there any real advantage with the big sea and strong currents? 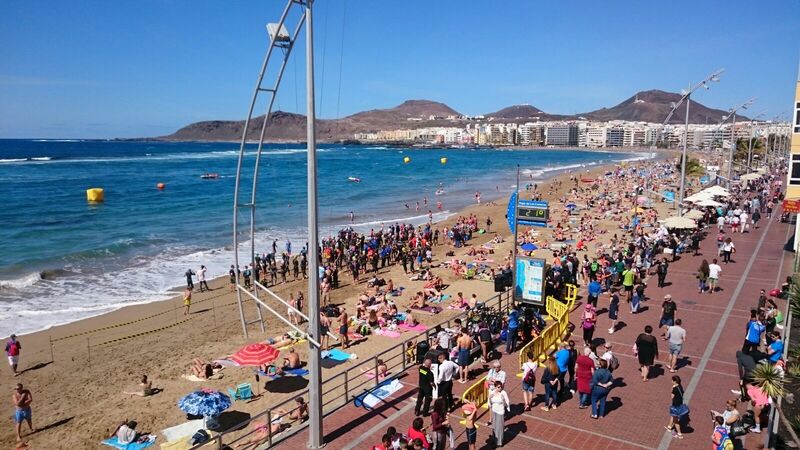 The waves breaking on the beach created initial challenges for the athletes as they made their way out to the first buoy and it was clear that those who had chosen to start near to Abuín would have the best line of sight to the turn. 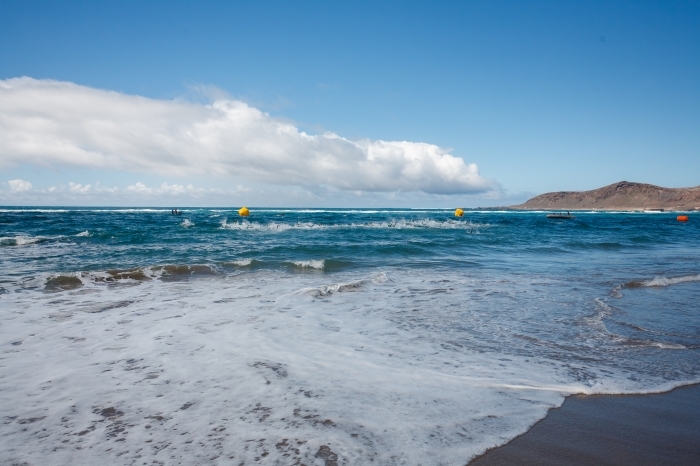 With no clear breakaway, it was an exciting turn to the right at the first buoy and then the athletes began to string out into a long line in the choppy waters. 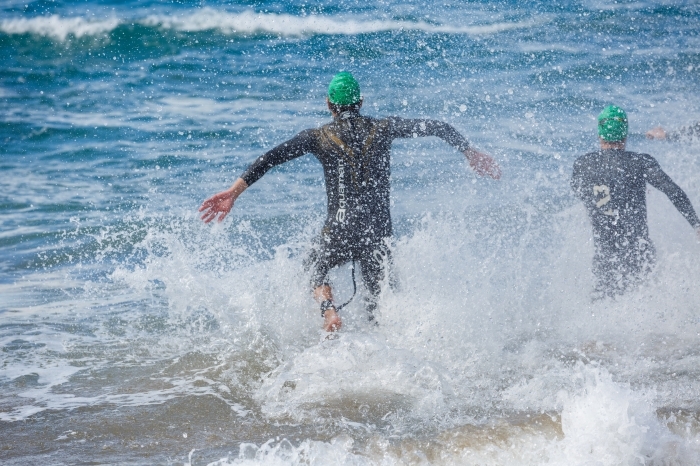 The leaders fractured into several small groups as they headed to the second buoy but with the waves tossing them around, it was not an easy swim. Less congestion at the second turn gave the leaders a chance to pull deeper and extend their lead in the 25-30kmph winds. As the athletes struggled, the spectators were enjoying 26C sunshine. 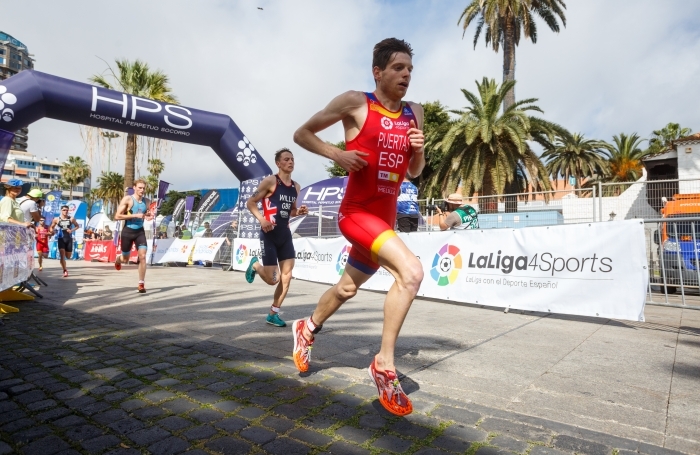 A long run to T1 was led by Kevin Tarek Viñuela to the loud delight of the Spanish supporters. 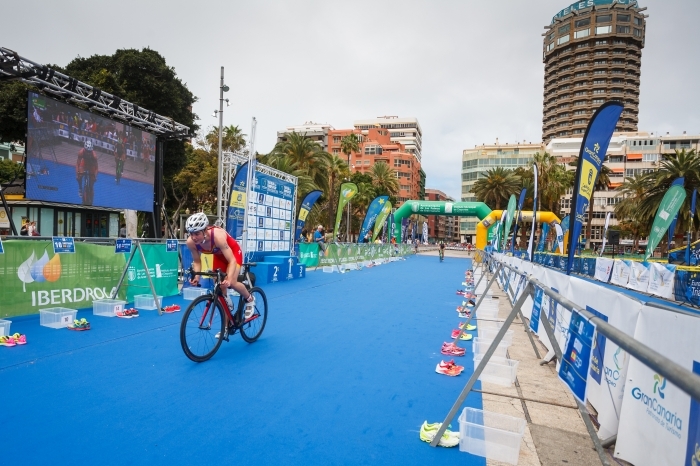 He is well-known for his speed in the water and we last saw him leave the sea in 2nd place in Melilla at the ETU Cup Final last year. 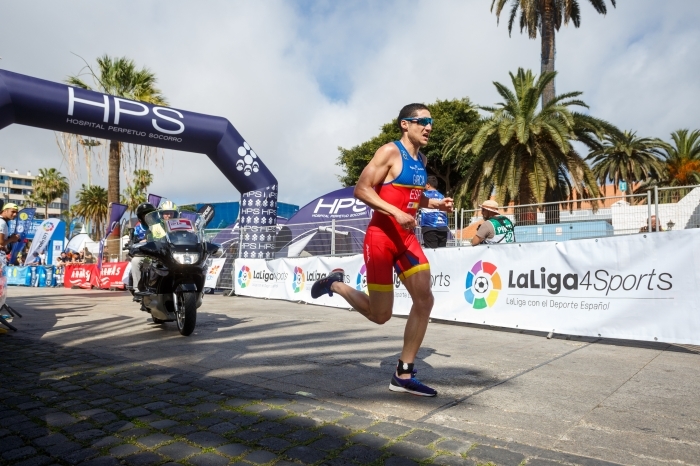 Behind him was David Castro Fajardo and behind them the chasing athletes were frantically getting their feet into the shoes to enable them to push hard on the bike pedals and catch up the leaders. On his own for a few minutes of glory, the chasing group of more than a dozen athletes soon had Tarek in their sights and worked wall to catch him, using the hill to their advantage and catching him just after the turn at the top. The roads were dry and the peloton could easily have attacked the turns but with nobody taking command, they just seemed to roll along. 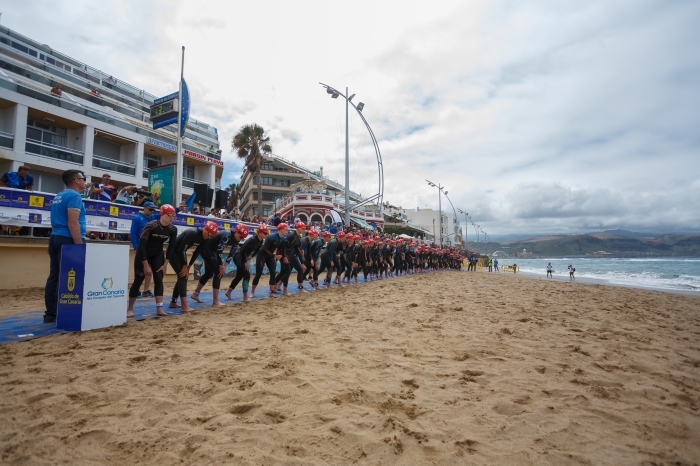 This was a risky tactic, with 50+ athletes behind them. The narrow, twisting downtown streets were ideal for a breakaway but it did not happen. As the first lap was completed, the leaders had just 17 seconds over the chase pack. Marco van der Stel NED tried to bring some order to the pack along with Antonio Serrat Seoane ESP and Jan Čelůstka CZE pushed for a bit at the front. 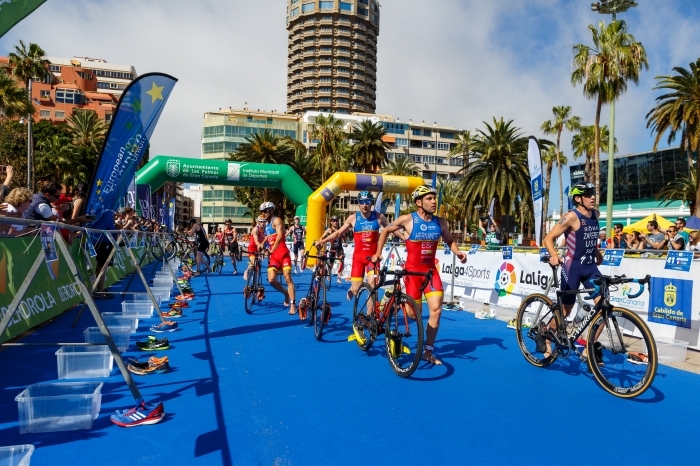 Even Tommy Zaferes USA tried to push the pace and suddenly Briffod was at the front. As they turned at the top of the hill they saw just how close the big chase pack was. A clear signal to either get the pace up, or be caught. As they headed down the hill, nobody was using Newton’s laws to gain an advantage and so it was pretty much inevitable that they would be caught soon and caught by a pack that held some fast runners. Coming to the blue carpet and the end of the second lap, their lead had been cut and in that pack was the immense running ability of GB’s Alex Yee. In his first race since that awful crash in Cagliari, he could easily outpace anyone but could this chase group get close enough? 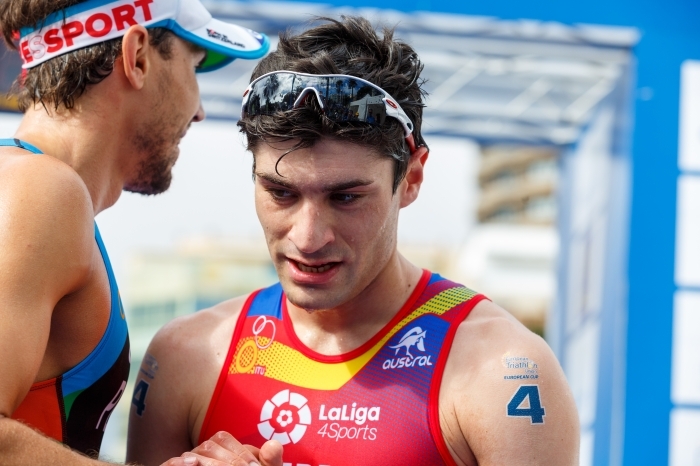 Sadly for the Spanish, their #1 athlete, Abuín, punctured and his race was over. The two young Brits, Christopher Perham and Barclay Izzard were well-placed in the leading pack but when Briffod broke away on the climb, they were tucked in at the back of the group and nobody had the pace to follow him. The Swiss athlete’s lead took him through shadows and pools of bright sunshine. His attack was well-timed and saw him lead back to the blue carpet and a lead of over ten seconds. 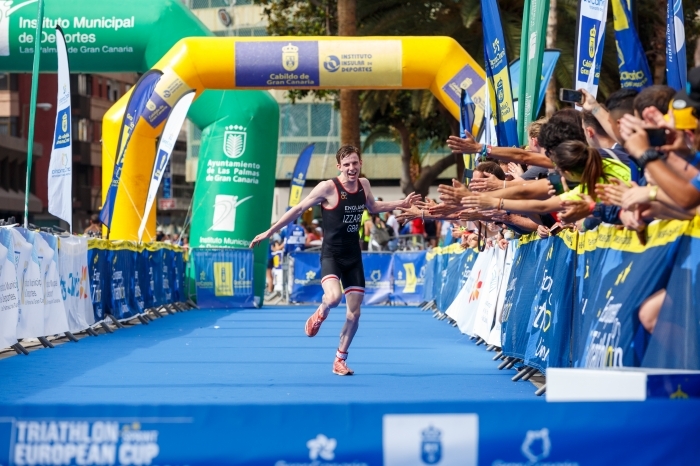 One lap to go – could Briffod hold the lead and then start his season with gold? Behind him there was a sizeable number of Spanish athletes who would want to get a home victory. Briffod worked the pedals hard and sped up the hilly sections. His lead was being eaten into by the peloton but at the top of the big climb he could see just how close they were. He had held them off as he started the long descent and now he had to keep focussed for the long drag to T2. Briffod held his position to T2 and had a 12 second lead. 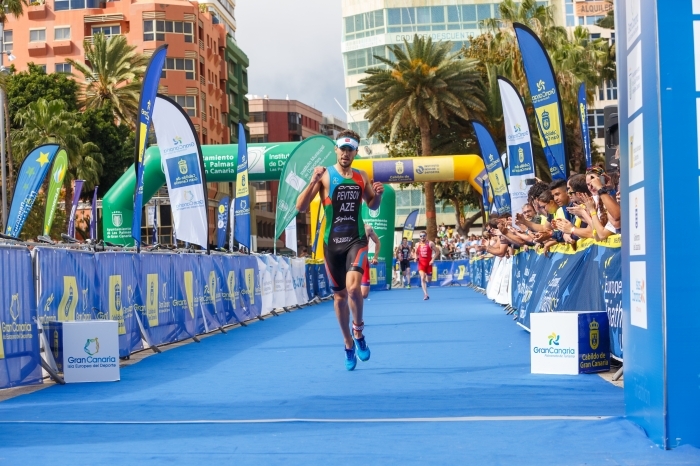 His flew out of transition and, running lightly on his toes, looked sure to be the winner. Behind, a small army of Spanish uniforms were hunting him down and as the last of the leaders left T2, the big chasing peloton entered T2. Yee, sensibly, held off on the bike and was last of those to leave the blue carpet. He is still carrying a pretty bad injury (stitches in his foot) after winning the British Universities Cross Country Championships and picking up not only the title but a set of spikes in his foot from another athlete. Briffod was striding comfortably and we have seen his pace before. Victory looked to be his. Behind him was one athlete, about 15m back. It was Izzard. He spotted Briffod and ran past him as if the Swiss athlete was stationary. An incredible statement so early in the race but he looked relaxed and was pulling away. 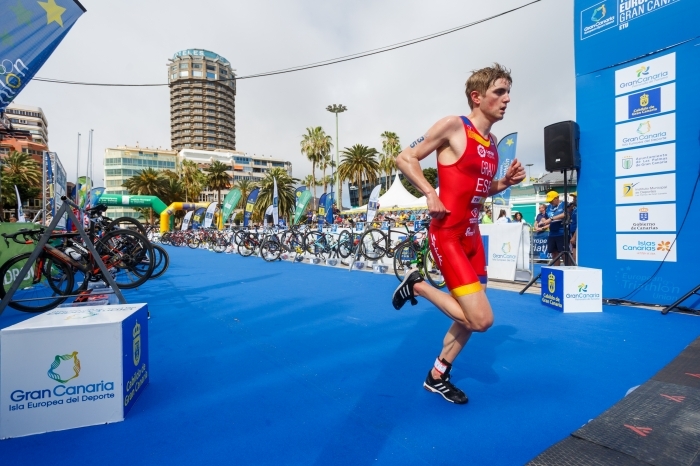 He had posted the 2nd fastest run of the day when he came 6th in Rotterdam at the worlds. Beaten only by the amazing running of Ben Dijkstra GBR who is currently out with an injury. Izzard had placed himself well on the bike and stayed out of trouble. He was now running wild with gold in is mind. One lap completed and he was the length of transition ahead of Briffod. 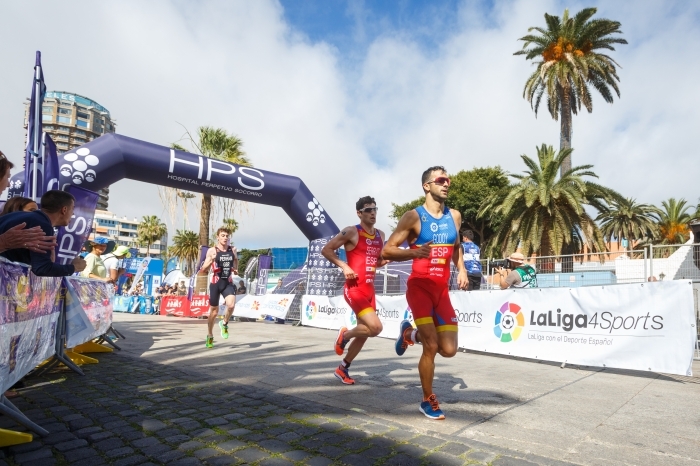 Behind the Swiss athlete, two Spanish athletes, Serrat and Antonio Benito Lopez were neck and neck and then came Perham. The defending title holder, Pevtsov, was leading the next chase but well down and with a lot of work to do. Back at the front and Izzard was showing no signs of fatigue. A fast turnover rate took him further away from Briffod. Izzard was running to a GB double. 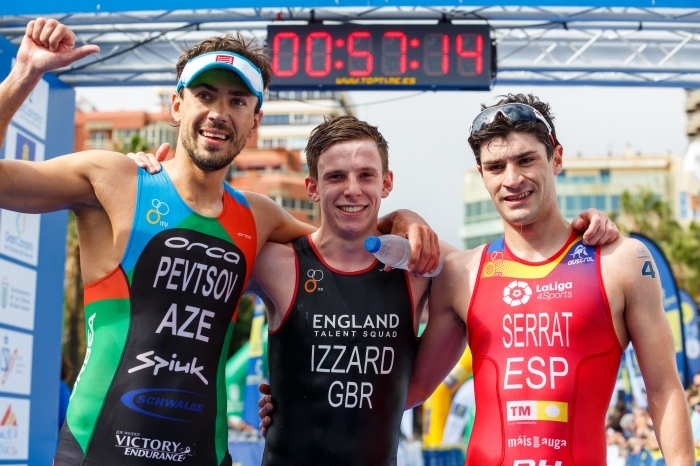 Behind him, Briffod was holding on to 2nd place but behind him Perham had split the Spanish athletes. A glance over his shoulder and Izzard knew that he was safe. His pace was so fast that he was now lapping athletes. 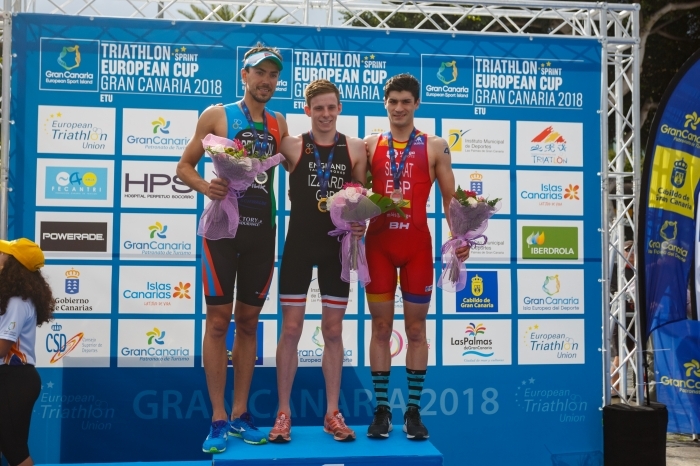 The crowds in the finish area were getting ready as the commentator whipped up the emotions and the Brits on holiday were given a great moment to see the young Brit take gold. 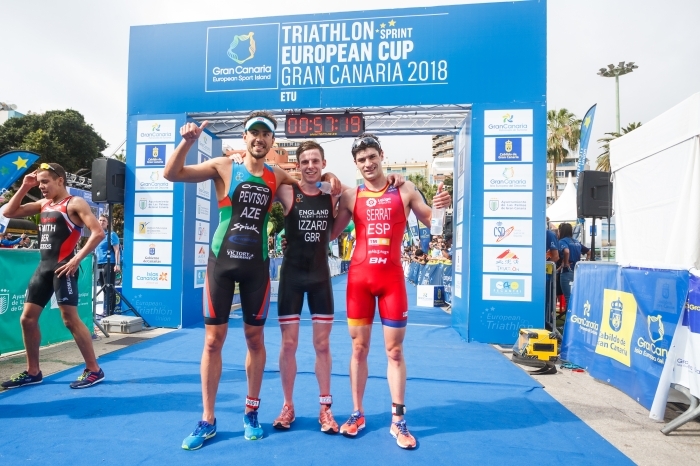 Behind and it was Pevtsov who powered through the field to take silver ahead of Serrat. Just missing the medals was Benito, ahead of Perham and with an amazing run, Alex Yee ensured that the British points haul was impressive. 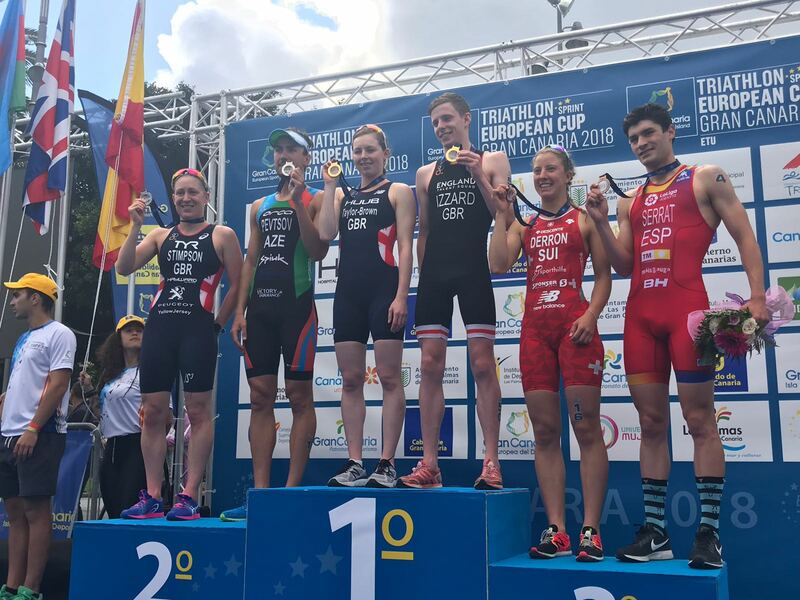 A great start to the ETU Triathlon European Cup season. 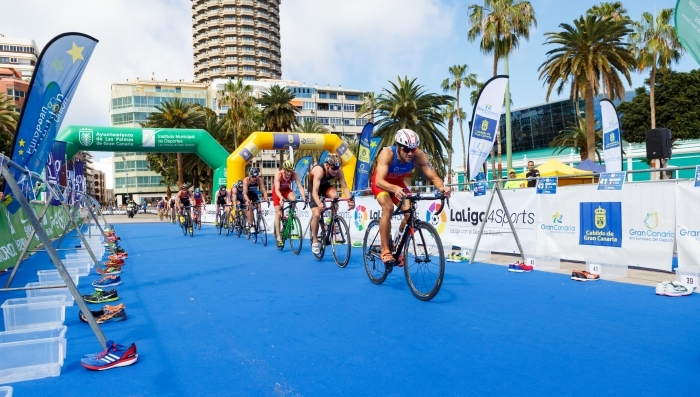 Once again the Spanish Federation have hosted a well-run event that has delivered a truly thrilling race and alongside it a mass-participation event that showcased the sport. 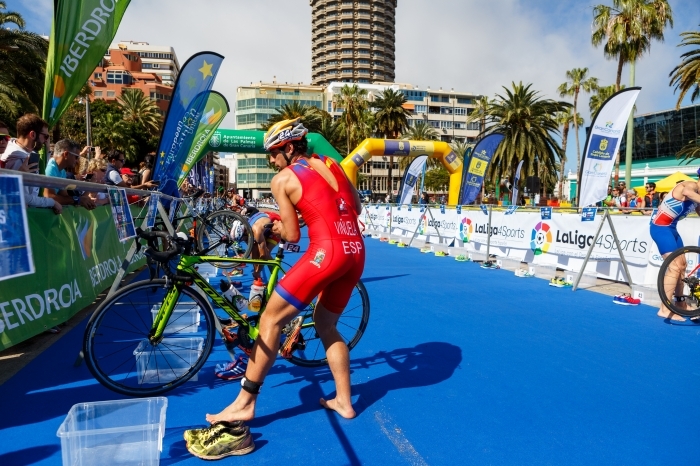 Our thanks to FETRI Media, Revista Triatlón and Israel González Pavón for the photos so far. 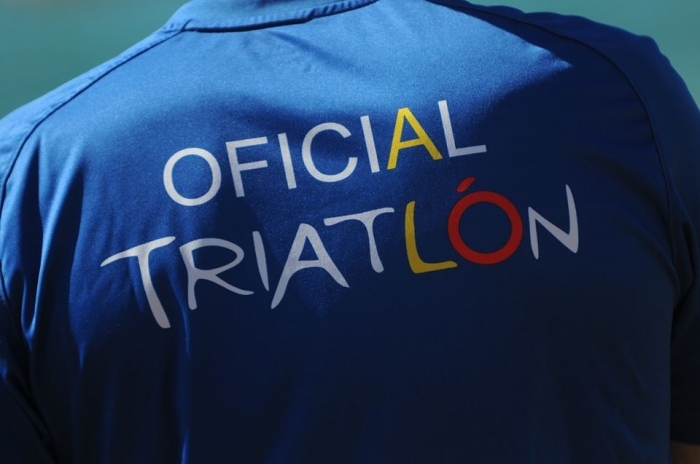 As soon as the media team have completed their work we will get some more images to you but for now, adiós y gracias.